Baylor Shines at the Washington Model Organization of American States! The Baylor Model Organization of American States (MOAS) team continued its tradition of success at this year’sWashington, DC Model Organization of American States meeting, held from April 7-11. Opening and closing ceremonies were held in the Hall of the Americas in the Organization of American States Headquarters. At the opening ceremony, the Secretary General of the OAS, José Miguel Insulza addressed over 400 students representing all 34 of the organization’s active members. In addition to universities across the United States including the Air Force Academy, Tulane, and Drexel there were teams from Argentina, Venezuela, Colombia, Guatemala, Ecuador and the Bahamas. Baylor’s team represented the country of Mexico and was able to visit with Mr. Héctor Agustín Ortega Nieto at the Mexican Mission to the OAS. Mr. Ortega reviewed the position paper and resolutions and he praised the Baylor team’s preparations. “From the different schools that I have received (from the US and from other countries) your students are the ones that have been more informed about Mexico and that have presented the more interesting resolutions.” At this year’s model, Seth Reed (Senior, Political Science and Economics, Cassville, MO) served as president of this year’s model, and Joshua Hyles (Graduate Student, History, Mabank) served as chair of the Budgetary Affairs Committee. Additionally, Baylor University students were elected to three of the five top officer positions for 2010: Renee Sanchez, Head Delegate (Senior, Biology, Brownsville) was elected president, Michael Lyssy (Freshman, Political Science, FallsCity) was elected chair of the Committee on Integral Development, and Hunter Klein (Senior, Political Science, Tomball) was elected as chair of the Budgetary Affairs Committee. This marks the third consecutive year Baylor has held the budgetary chair, and the fifth conference in nine years of participation in which a Baylor student has been elected president. Other team members included: Krystal Dau, Co-Head Delegate (Senior, International Studies, Las Vegas, NV), Ariel Alexander (Senior, French and International Studies, Córdoba, Argentina), Emmanuel Muñoz (Senior, Neuroscience, San Antonio), Tyler Talbert (Junior, International Studies,Waco), Monica Uribe (Senior, Music Performance, Harlingen ), T.J. Cheavens, Jr. (Senior, International Studies, Austin), Ricardo Felix (Senior, International Studies,Waco), and Torie Rhodes (Sophomore, International Studies and French, Pasadena, CA). Dr. Joan E. Supplee serves as faculty advisor for the MOAS team, which returns to San Antonio for its fall conference in November. 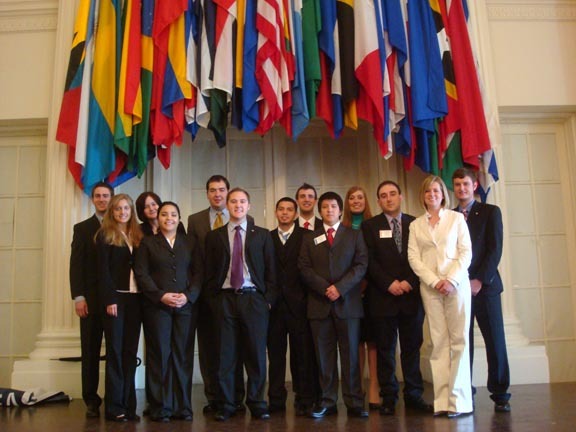 Baylor Students in the Hall of the Americas in the OAS Headquarters. From l to r: Hunter Klein, Ariel Alexander, Krystal Dau, Monica Uribe, Seth Reed, Tyler Talbert, Ricardo Felix, Michael Lyssy, Manny Muñoz, Torie Rhodes, Joshua Hyles, Renee Sanchez, and T.J. Cheavens.